Diamondback moth (DBM) is a persistent pest in the Salinas-Castroville area. We were able to find late instar caterpillars in several spots along Blackie road on Tuesday January 22nd. Basically, these caterpillars were feeding on brassica weeds, located along the side of the road (Fig. 1). This is an example of how insects exploit weeds as alternative hosts when there is a lack of a preferred and abundant host plant in the landscape. DBM will continue feeding on these weeds, while increasing their numbers. 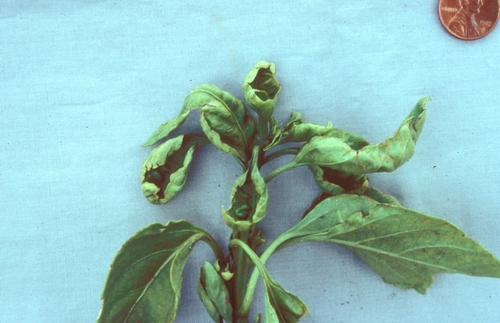 These DBM adults, originated from weeds, have the potential to infest any commercial cole crop during the upcoming weeks and months. Based on our observations, most of these caterpillars were close to pupate. Within the next two weeks, we might see an influx of DBM adults flying around fields and weed patches. A new generation of caterpillars may be present around mid-February in our system, depending on temperature fluctuations. It seems like not all of these caterpillars will become adults. Approximately, 10% of the caterpillars collected from Blackie road were parasitized by Diadegma wasp. We took these caterpillars to the UCCE Entomology lab to refresh and re-introduce DBM into our colony; and we were able to spot the parasitic wasp pupae inside our rearing containers (Fig. 2). Fig. 2. Brown barrel-like Diadegma pupa (top) and light green diamondback caterpillar (bottom) on a cauliflower leaf inside a rearing container at the UCCE Entomology lab. Ideally, controlling weeds outside our fields and along the roads could be part of our strategies to manage resident pest populations. Control of these weeds will allow to reduce population of these pests cycling through the winter here in the Salinas-Castroville area. 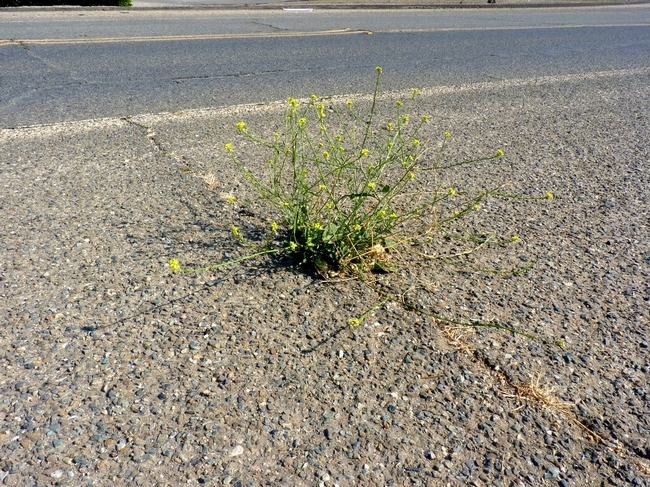 Managing these weeds could be challenging too, due to accessibility and other issues. Please, keep in mind that cole crop fields surrounded by weedy patches will have a higher chance to be infested with DBM. You could prioritize the scouting of those fields to timely detect any economically damaging DBM population in your crop. If you would like to learn more about DBM and the research conducted by the UCCE Entomology team, please contact Alejandro Del-Pozo at adelpozo@ucanr.edu or 831-759-7359. Bagrada bug (Bagrada hilaris) is an invasive stink bug that was first observed in the Salinas Valley in October-November 2013. We started monitoring bagrada bug populations in non-crop habitat up and down the Valley starting in January 2015 and have continued to do so since then. We have seen bagrada bug populations beginning to develop on the weeds in spring and summer months. Weeds are clearly a key factor for bagrada bug populations in our region. 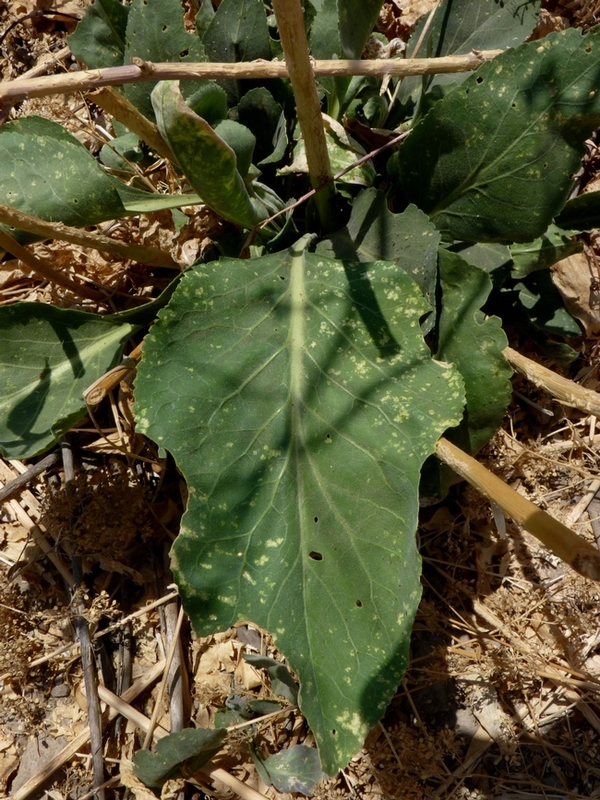 While cruciferous crops are available year-round in the valley, stands of weeds are typically where populations really build up during early- and mid-summer (Fig 1). In the Salinas Valley, shortpod mustard (Hirschfeldia incana, or summer mustard; Figs. 2 and 3) and perennial pepperweed (Lepidium latifolium; Figs. 4 and 5) appear to be the two most important weeds for buildup of bagrada bug populations. 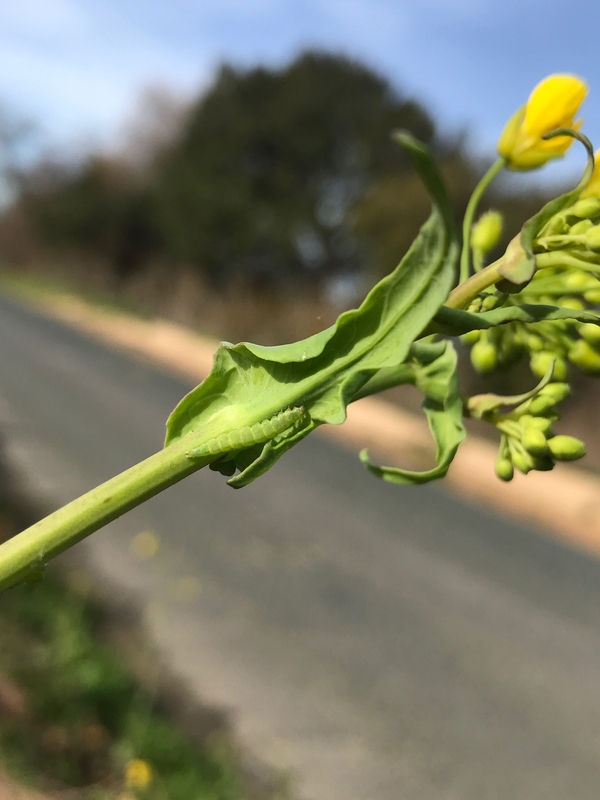 We have found bugs (in extremely high numbers) on perennial wall rocket (Diplotaxis tenuifolia), a weed commonly found along Hwy 101 between Chualar and Soledad, but this was very late in the year when temperatures were cooling and after the time bagrada bugs are typically problematic. These three weeds are non-native and invasive, just like the bagrada bug. 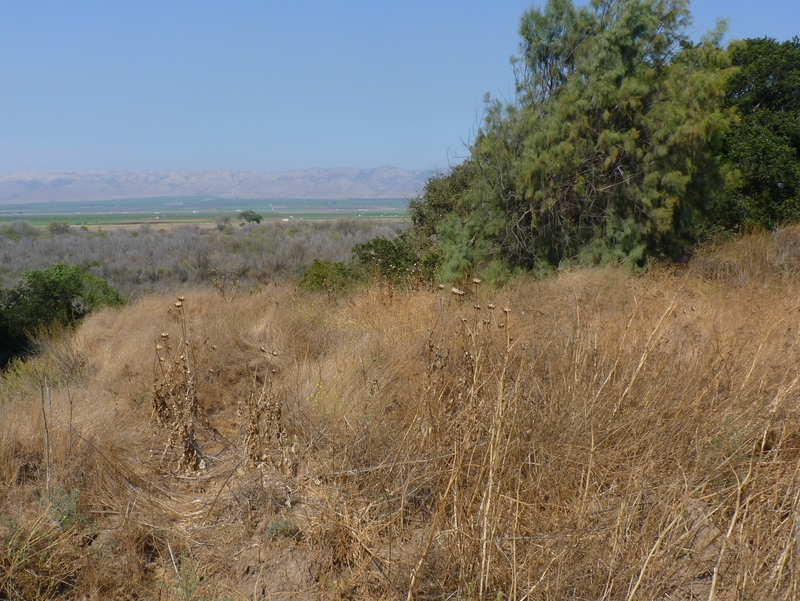 For our survey, we have been surveying a number of sites that cover the length of the Salinas Valley (Salinas, Chualar, Gonzales, Soledad, Greenfield, King City, San Lucas, San Ardo, and Watsonville). These sites contain a stand of at least one of these weed species, although we focused on pepperweed and/or shortpod mustard at the majority of the sites. Each month, we search for damage and bagrada bugs on the weeds at each site for twenty-minutes or until insects are counted on five plants of each species. When leaves are actively growing and not already damaged and worn out, damage is often easier to detect than insects (Figs. 6 and 7). This is similar to scouting in fields, where checking plants for fresh damage is the recommended method of scouting (Palumbo 2015). 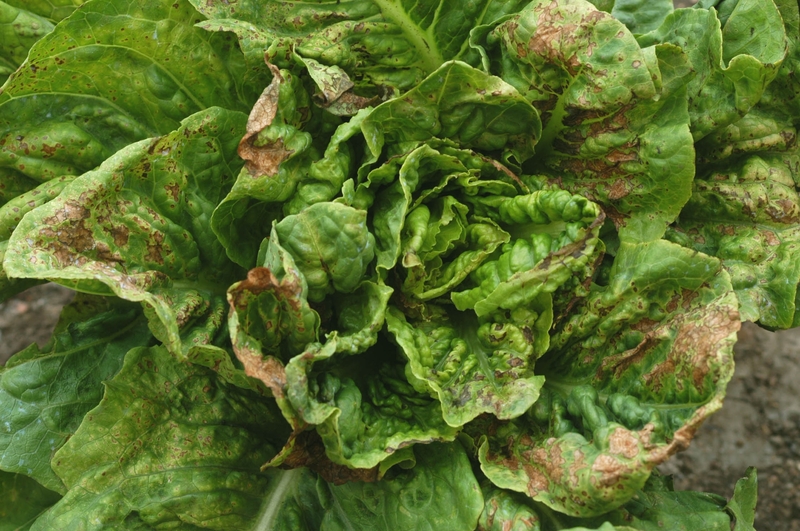 Unfortunately, fresh damage can be hard to find on older weeds because old damage obscures fresh damage, leaves are extremely tough, and bugs feed on stems or seed pods, so we primarily rely on detection of actual bugs. When we surveyed near the end of June this year, we did not find high populations of bagrada bugs or damage, although they were present at some sites. We were left wondering what would happen with bagrada bug populations this year. After our July sample date, how 2016 populations compare with 2015 is still not clear, although we have started finding small populations of bagrada bug, which suggests we won't be having a bagrada bug-free year. If anything, there may be a slight delay in bagrada bug movement into fields, although this is fairly speculative. The spring rainfall this year was definitely greater than in 2015, although what effect of rainfall had on winter and spring bagrada bug populations is not clear. In 2016, we added a number of new sites, so some sites have already been surveyed during one period of population peaks, while others have only been surveyed since the beginning of this year. At the three sites we surveyed in 2015 with perennial pepperweed, we did not see populations jump until our survey time point in late August. This year, we have not seen populations increase appreciably, although we will have to see what we find at the end of August to compare to 2015. At some of the sites with shortpod mustard that we surveyed in 2015, we had already found a fair number of bagrada bugs by this time last year, including some large populations of nymphs (up to 3 to 5 adults per plant and 18 to 57 nymphs per plant). This year, we haven't seen the same populations yet at those sites. Next, we have the sites that have only been surveyed in 2016. While the initial sites were chosen based on prior issues with bagrada bugs in nearby fields, the new sites were not necessarily chosen based on the same conditions. We chose these new sites to improve the coverage of our survey. Each site also contains at least one of the three weed species we have focused on (shortpod mustard, perennial pepperweed, or perennial wall-rocket). A few sites were chosen knowing that bagrada bugs were present in 2015. A few of these sites have plenty of weeds available for bagrada bugs, but as of yet, we haven't seen any bugs. Some sites do have developing bagrada bug populations. 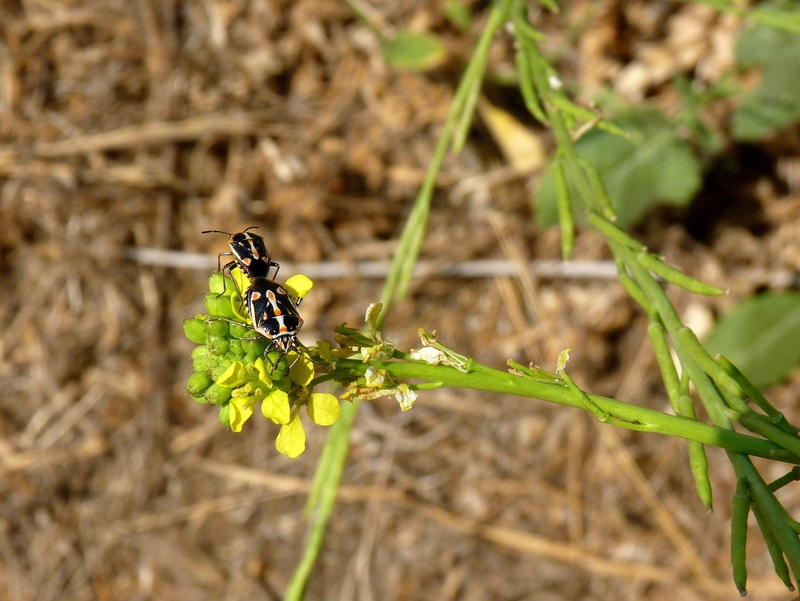 We found what appears to be growing populations of bagrada bugs on both shortpod mustard and perennial pepperweed at one site near San Ardo on our last survey date (July 25th/26th). In the foothills near Gonzales, we found 1 to 26 bagrada adults and 0 to 22 nymphs on shortpod mustard plants. 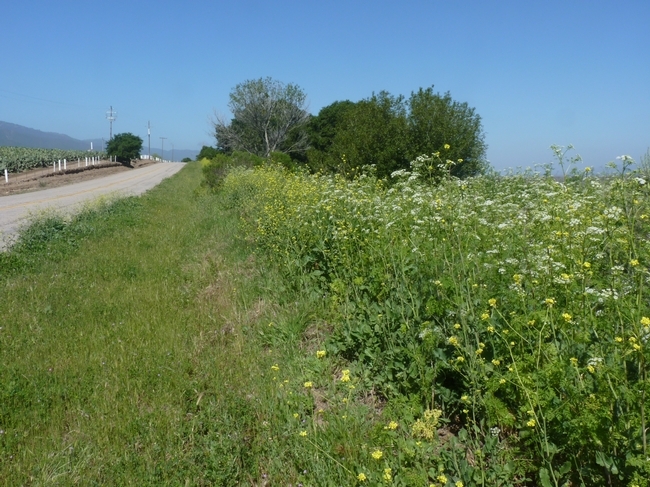 In addition, we were able to easily find bagrada bugs (0 to 8 adults, 0 to 3 nymphs) on shortpod mustard plants growing along US-101 between Greenfield and King City (Fig. 8). As many of you that have driven this stretch of road may know, there are a lot of weeds there. This means that a handful of bagrada bugs on each plant can quickly add up to large populations when summed over thousands of plants. As the weeds senesce, bagrada bugs will likely concentrate on still-green plants, although this patch can only support the bagrada bugs for so long with plants continuing to senesce. As we see it, the issue is when these growing populations of bagrada bugs run out of food in the patches of weeds, and then go in search of new food sources. At this point, they can start finding their way into fields of cruciferous crop. This time of year, much of the shortpod mustard in the Valley is starting to set seed and will soon completely dry up if it has not already. In many locations, the vast majority of plants are almost dry. In the same localized area, some shortpod mustard plants will be completely senesced, while others are still green and flowering (see Figs. 9-11). 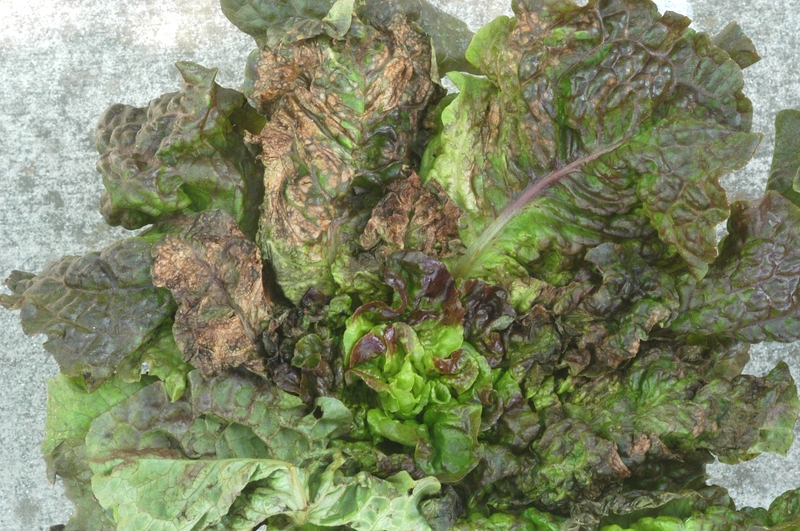 Differences in growing conditions at a fairly small scale can therefore be very important. If all of the plants dry up, bagrada bugs will be forced to disperse, possibly triggering infestations in crop fields. If green plants remain, they may retain bagrada bugs, shifting the risk of infestation. 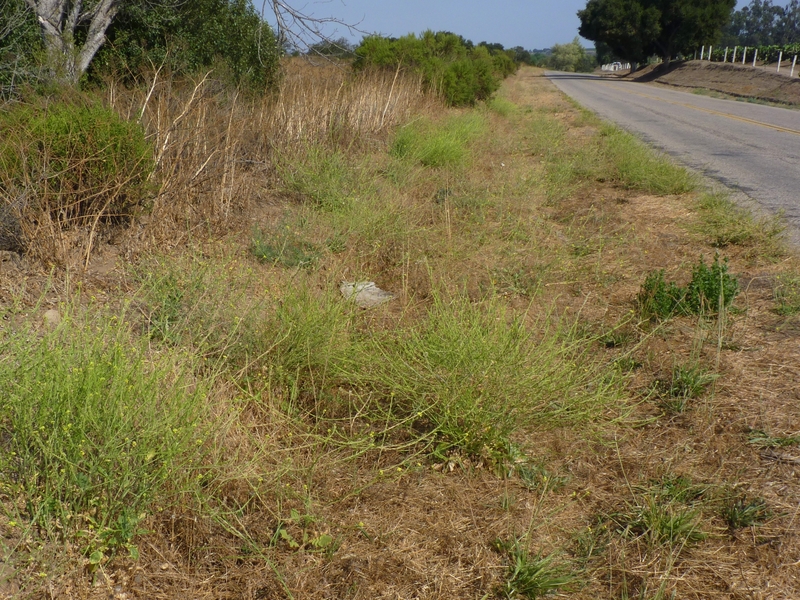 Perennial pepperweed can persist late into the fall, but this is dependent on availability of water, damage by bagrada bugs, and disease pressure (pepperweed is often afflicted by white rust; Koike et al. 2011). The timing and severity of bagrada bug infestations in fields seems to be closely tied to what is happening on the weeds, so a better understanding of population dynamics on weeds will be needed to better predict an influx of bagrada bugs. The next step will be to figure out how to incorporate bagrada bug populations in weeds into management and scouting plans. 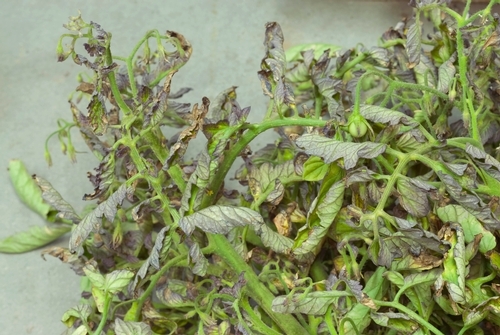 It is already common for PCAs to check weeds for bagrada bugs and we believe this to be a useful tactic. At this point, we suggest checking weeds on the edges of fields and any large patches of weeds within ~ 0.5 miles that seem to be likely sources of bagrada bugs. Consider which sides of crop fields often get infested the most or earliest and search for weeds on that side of the field. The dispersal ability of bagrada bugs has not been well characterized, but cases in which fields are colonized even when no cruciferous weeds or only bare ground is nearby show that bagrada bugs can move significant distances. While often seen walking, bagrada bugs readily fly, especially when surface temperatures are above 100° F based on preliminary observations. 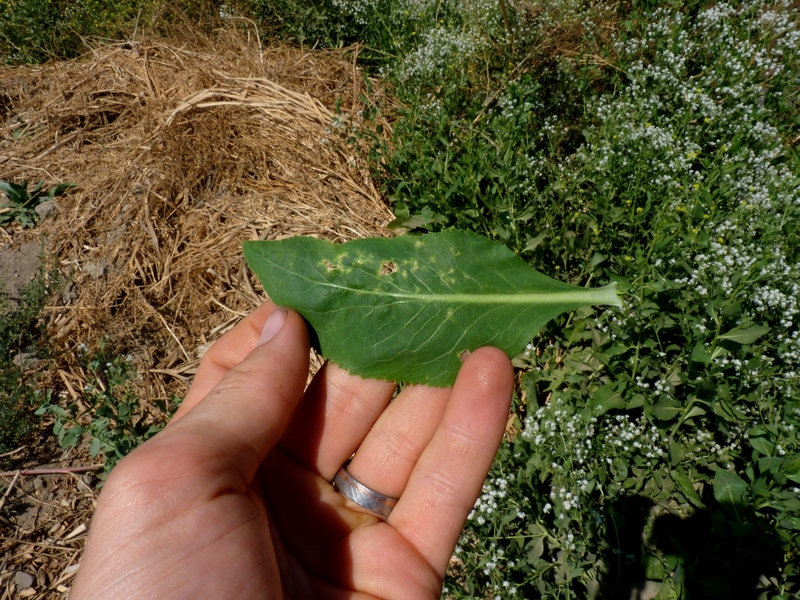 When perennial pepperweed is green and leaves are growing, new or recent damage should be readily apparent. Damage on “old growth” shortpod mustard is not always readily apparent, so finding bagrada bugs themselves is necessary. Adults are often found feeding on flowers, buds, or seed pods, so these are the best plant structures to scan. We believe bagrada bugs on weeds are mainly a threat to crop fields once the quality of these plants starts to decline, so pay attention to weed phenology and damage severity on weeds from both bagrada bugs and disease. Management of weeds is another option to limit the population growth potential of bagrada bugs. Sanitation of both weeds and crops has been a recommended cultural management tactic in the pest's Old World range (Palumbo et al. 2016). 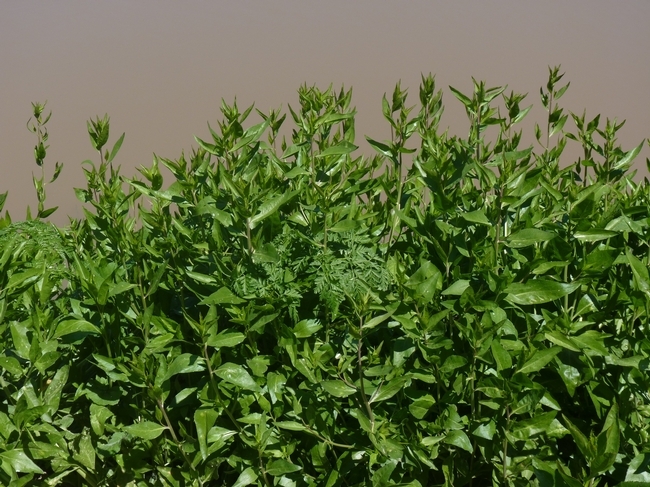 By removing nearby weeds, you may be able to prevent an economically significant infestations. If weeds are managed, the timing will be important. For shortpod mustard, if it is possible to successfully manage weeds when they are still small, this may prevent build up of bagrada populations from the very beginning. However, resurgence of the weeds may happen with sufficient soil moisture early in the year. A more efficient tactic may be to manage shortpod mustard once it has bolted and is flowering later in the season (~ late April to May). This will help prevent resurgence of weeds but will still intercept bagrada bug populations before they have a chance to build to a significant degree. 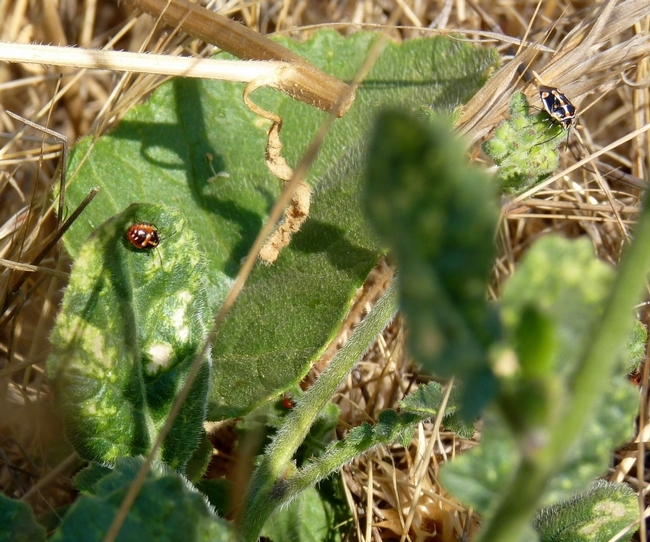 Managing weeds later and once bagrada bug populations have developed could push insects into crop fields. The timing of weed management could also be tied to the susceptibility of nearby crops, which could help if bagrada bugs are already present on the weeds. Adult bagrada bugs moving into a 40 day-old broccoli field because the weeds they were on were mowed or disced would likely not cause economic damage. However, managing weeds near a newly planted field could make matters worse and create a pest problem. Even if nearby weeds don't harbor bagrada bugs early in the season, they may serve as an intermediate bridge between the crop fields and weeds that are further away. Unfortunately, it is likely impossible to manage weeds far enough out from fields to eliminate the threat of bagrada bugs. The landscape context is important, but exercising control over the entire landscape is not possible. 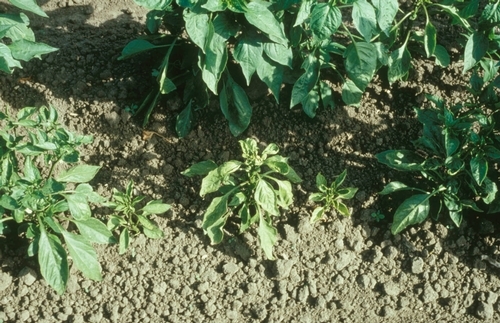 Perennial pepperweed is a trickier weed to deal with given its phenology and ability to rapidly re-sprout. 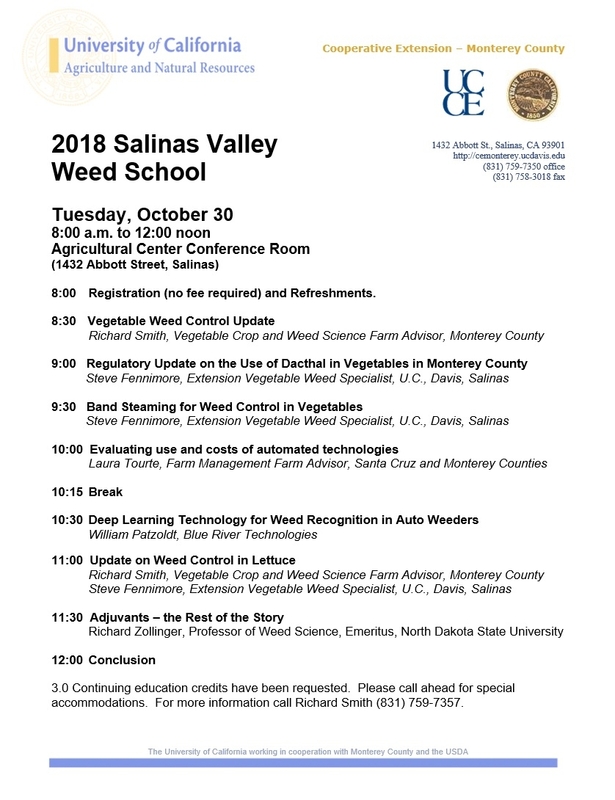 These weed species are not about to disappear from the landscape in the Salinas Valley, so they will continue to play an important role for developing bagrada bug populations. Koike, S. T., M. J. Sullivan, C. Southwick, C. Feng, and J. C. Correll. 2011. Characterization of white rust of perennial pepperweed caused by Albugo candida in California. Plant Disease 95:876. Palumbo, J. C. 2015. 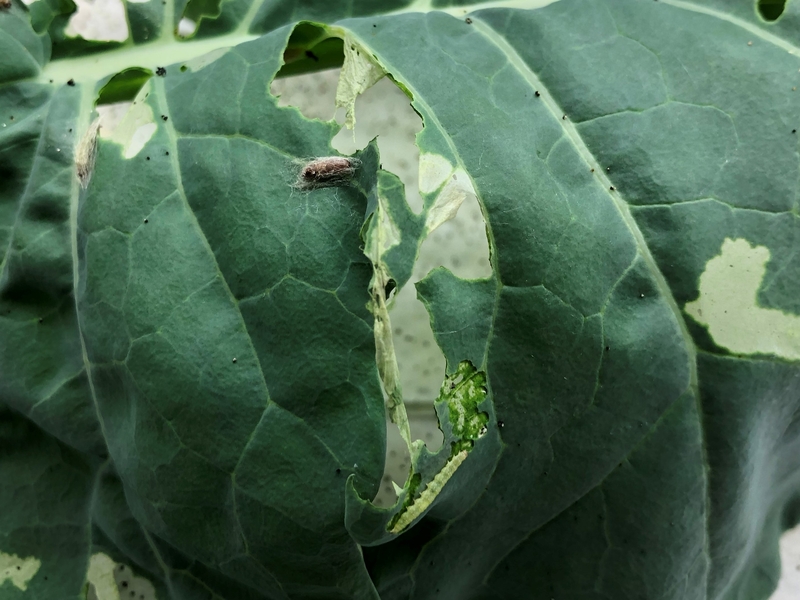 Association between Bagrada hilaris density and feeding damage in broccoli- implications for pest management. 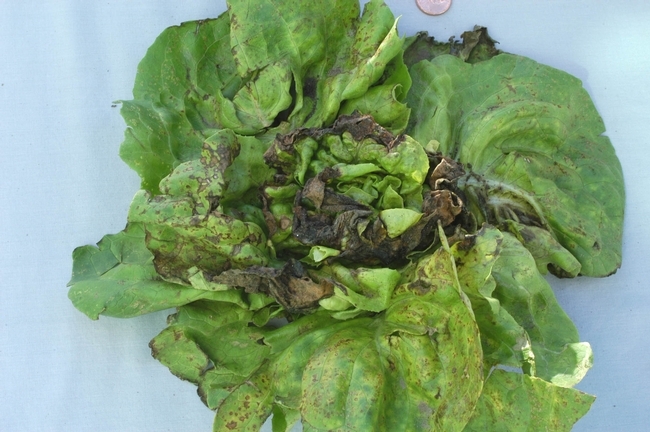 Plant Health Progress 16:158–162. Palumbo, J., T. Perring, J. Millar, and D. A. Reed. 2016. Biology, ecology, and management of an invasive stink bug, Bagrada hilaris, in North America. Annual Review of Entomology 61:453–473. Fig 1. Adult and nymph bagrada bug on a still-green shortpod mustard plant after grasses have completely dried. Fig 2. Shortpod mustard growing in the shoulder. Fig 3. Bagrada bugs feeding on shortpod mustard flowers. Fig 4. A stand of perennial pepperweed in the spring. Fig 5. 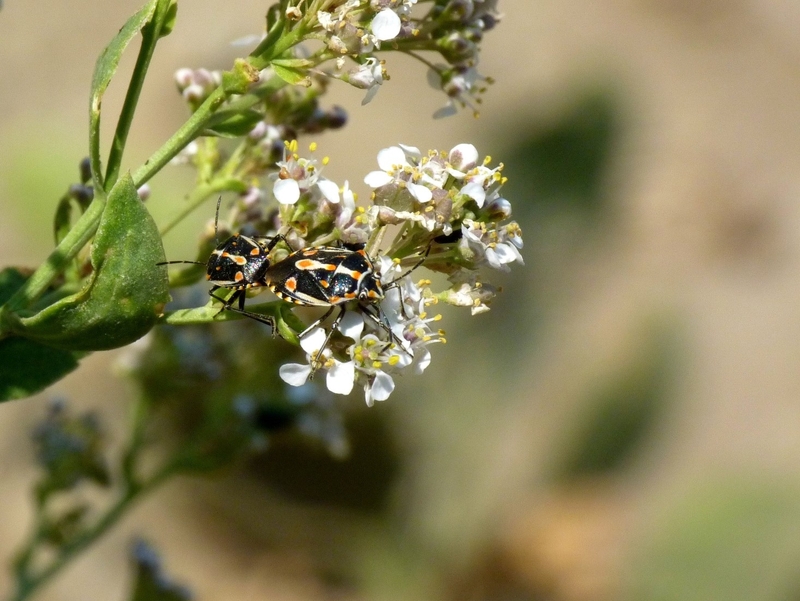 A pair of bagrada bugs on perennial pepperweed flowers. Fig 6. Bagrada bug damage on perennial pepperweed. 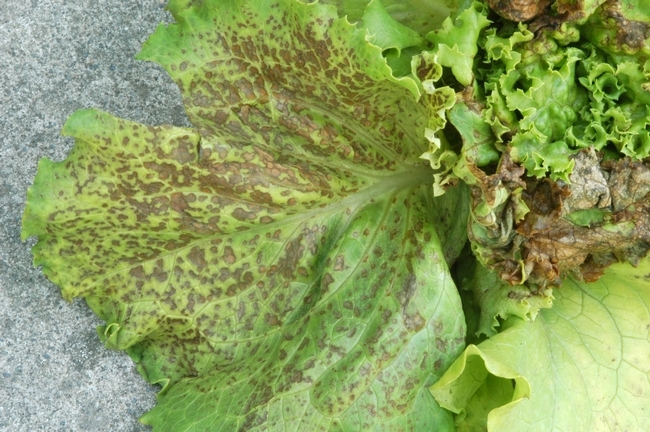 New lesions still appear green in color and with distinct lines or “fans” from the “lacerate and flush” feeding by bagrada bugs. Lesions turn white as they age and the leaf tissue becomes chlorotic. Fig 7. Older bagrada bug damage on pepperweed. Lesions have developed into tattered holes. Fig 8. 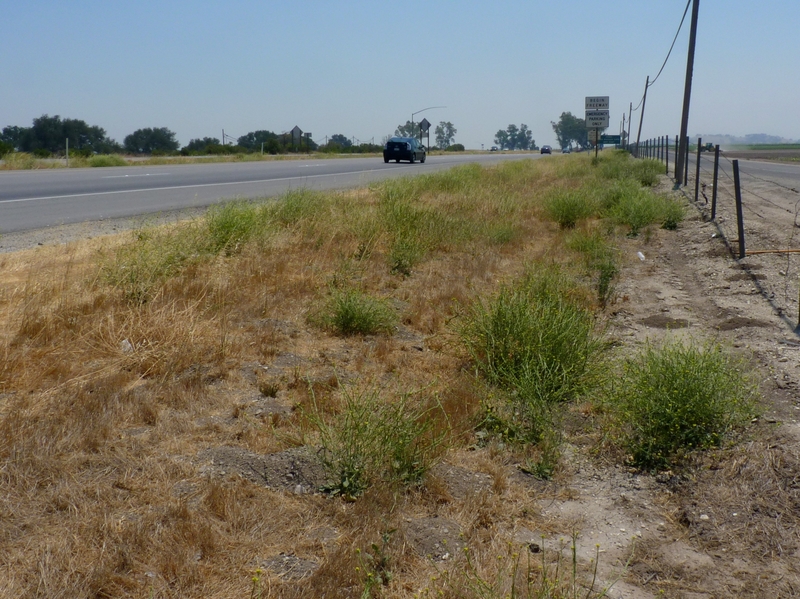 A typical roadside scene in the Salinas Valley (photo taken July 26, 2016). Some of the shortpod has completely senesced, but most plants still have green leaves, some flowers, and many pods. Fig 9. Shortpod mustard growing in the roadside near Gonzales, CA. Plants further from the road have almost completely senesced. Bagrada bugs were not found at this time point. Photo taken March 26, 2016. Fig 10. Shortpod mustard growing in the roadside near Gonzales, CA. Bagrada bugs were found on these plants. Photo taken July 26, 2016. Fig 11. The same site near Gonzales, CA, further from the road. Plants are almost completely senesced. Bagrada bugs were found on these plants. Photo taken July 26, 2016.